Donations presented to the North State Food bank, Butte County Community Action Agency. Pictured on the left, Thomas Tenorio (CEO at Community Action Agency of Butte County, Inc.), on the left J. Fletcher Monroe (President and Chief Executive Officer Golden State Farm Credit). Multiple associations of the Farm Credit System, which has served the nation's agricultural and rural communities for more than 100 years, have come to the aid of a community in need. Together they have donated nearly $500,000 to help victims of the devastating Camp Fire in Butte County, the deadliest fire in California's history. Golden State Farm Credit, which serves farmers and ranchers in Butte County, neighboring Colusa-Glenn Farm Credit, and the system's banking partner, CoBank, have coordinated efforts with the Farm Credit Associations across the United States to assist the efforts of local relief agencies, said J. Fletcher Monroe, Golden State Farm Credit's president and Chief Executive Officer. "We here at Golden State Farm Credit are honored to be part of the Farm Credit System, where we stand by each other and our communities in times of crises," Monroe said. "We are humbled by the outpouring of support, heartfelt prayers, and generosity received from so many. "The funds provided to these local organizations, along with a small portion given to the Employee Relief Fund to assist our staff members who lost their homes in the fire, will have an immediate impact as well as helping the long-term rebuilding efforts Butte County, residents, and businesses will face for years to come. We are thankful to all that have selflessly given to those in need." 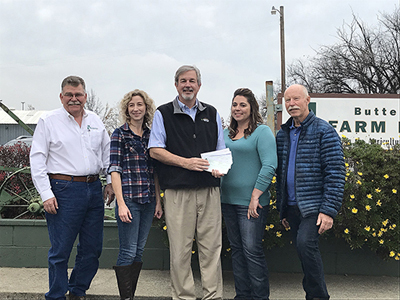 Participating in the effort are Farm Credit West, which also serves customers in a portion of Butte County, along with California-based organizations American Ag Credit, Fresno Madera Farm Credit, and Yosemite Farm Credit. Donations presented to the Butte County Camp Fire Animal Agriculture Assistance Fund. Starting on the left:Darren Rice (Butte County Farm Bureau President), Holly Foster(President Butte County Cattlemen�s Association), J. Fletcher Monroe (President and CEO Golden State Farm Credit), Tracy Schohr (Butte County Livestock Advisor), and Doug Bentz (Chairman Butte Agriculture Foundation). "California's agricultural communities have been heavily impacted by a series of natural disasters in recent years," said Leili Ghazi, CoBank's western region president. "Among all of these, the Camp Fire stands apart due to the scale of the devastation and the loss of life. CoBank is proud to join our Farm Credit partners to support the individuals, families and communities impacted by this fire. We hope that our gifts will, in some small way, help them on their journey to recovery." Organizations from outside the state assisting in the relief effort are AgVantis, Farm Credit of Southern Colorado, Northwest Farm Credit Services, Premier Farm Credit, Texas Farm Credit, and Western AgCredit. Relief agencies thanked Farm Credit Associations for their generous response to those in need. 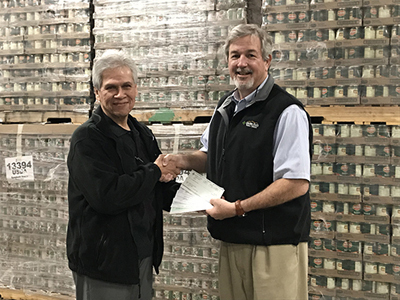 "The Community Action Agency is committed to serving hungry families at all times of the year but especially during the holidays and now with the addition of families impacted by the Camp Fire," said CEO Thomas P. Tonorio. "We're grateful to have the support of the Farm Credit System and others to help our communities." "The generosity from outside of Butte County and within our counties boarders, supporting the Camp Fire Animal Agriculture Fund has been a humbling experience. On behalf of the Butte Ag Foundation, I'm honored we could be a part of this effort." - Doug Bentz, President, Butte Ag Foundation, Inc.
Farm Credit has always been a steadfast supporter of Farm Bureau and the Butte County farming and ranching community so while we are appreciative of their generous donation to the Camp Fire Animal Agriculture Fund, we are not surprised that they stepped up to support agriculture and the Camp Fire. It is what they do. - Darren Rice, President, Butte County Farm Bureau. The blaze broke out on November 8 and consumed more than 153,000 acres before being fully contained a month later. A total of 85 residents and three firefighters were killed and almost 14,000 homes, along with 528 commercial buildings and nearly 4,300 other structures were destroyed. Monroe said the fire had an impact on agriculture as well. Several Golden State Farm Credit members lost homes and outbuildings, at least one lost a business in Paradise. The fire affected local bee keepers, destroyed a small vineyard, and burned a great deal of range land. The fire also hit the local 4H and FFA programs, where the kids lost structures they would have used to raise their fair animals. In addition, five Golden State employees lost their homes in the fire.